Welcome to the Rotary Club of Maffra Mardi Gras 2019 page! 2019 Street Carnival and Parade - Saturday, March 16th. The Maffra Mardi Gras was commenced in 1957 by a group of local businessmen who had gathered together to raise money for the Maffra and District hospital. Each entrant was voted for with a penny. The winner was announced who then collected a trip interstate with a chaperon. Some sixty years later, little has changed over the years with a six week fund raising period where entrants and their committees raise as much money as they can from a variety of activities. In 2018 this event celebrated it's Diamond Jubilee, making our event the oldest running community event in the Wellington Shire! In 2009 the Rotary Club of Maffra became the lead organisation because of their commitment to their community and insurance requirements. The following year, 2010 was their first Mardi Gras. The name was altered to the Rotary Club of Maffra Mardi Gras, reflecting that responsibility. The Rotary Club of Maffra has continued to develop the event into a family fun day, with face painting, animal petting nursery, rides, jumping castle, music, street parade, along with food, craft and market stalls. All of this helps to create a carnival like atmosphere. The concept of raising funds for community organisations has not altered over all this time with a variety of sporting clubs, kindergartens, primary schools and secondary colleges, aged care facilities, and wildlife shelters having previously participated. Profits from the Rotary Club of Maffra Mardi Gras are returned to community organisations annually when the Club makes their disbursements. In 2018 Stretton Park received a donation of $13,000! In 2019 the theme is Farmers and their Communities giving lots of scope for your parade entry. 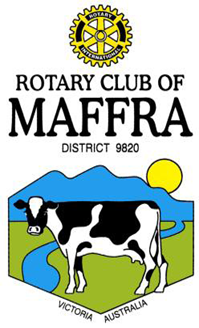 The Rotary Club of Maffra welcomes community organisations and clubs from within the Wellington Shire to have an entrant in next year’s event. Guidelines and Nomination forms are in the links beside this article. They are seeking expressions of interest from entrants, market, craft and food stalls along with buskers and interested truck drivers who wish to display their trucks. Please email rotaryclubmaffra@gmail.com or phone 0409 030 918 or 0458 247 862 for more information. Members of the public who would like to contribute to the running of this iconic event are welcome to contact the club via the email address above.